We have established that, over the East African region, the trough of the equatorial ionisation anomaly (EIA) during high solar activity and quiet geomagnetic conditions lies slightly south of the magnetic equator. During the equinox and December solstice seasons, and a local time interval of 13:00–15:00, the probability of observing the EIA on days with daytime equatorial electrojet (EEJ) strength ≥ 40 nT was mostly > 80 %. 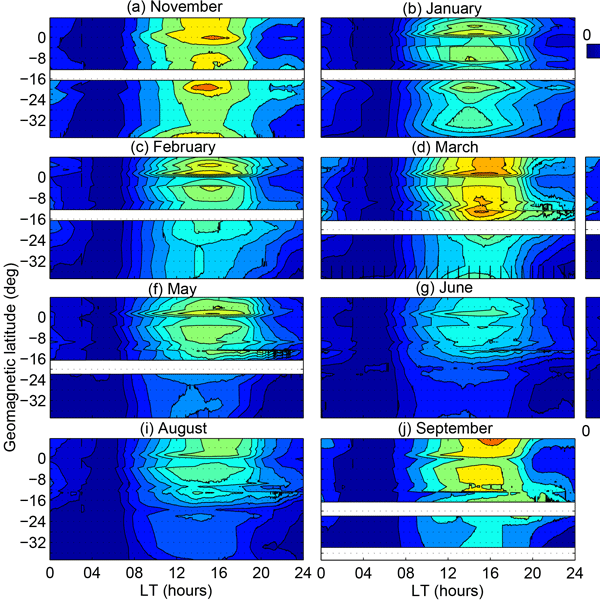 A series of interplanetary coronal mass ejections in the period 7–17 March 2012 caused geomagnetic storms that strongly affected the high-latitude ionosphere in the Northern and Southern Hemisphere. Interhemispheric comparison of GPS phase scintillation reveals commonalities as well as asymmetries, as a consequence of the coupling between the solar wind and magnetosphere. The interhemispheric asymmetries are primarily caused by the dawn-dusk component of the interplanetary magnetic field.